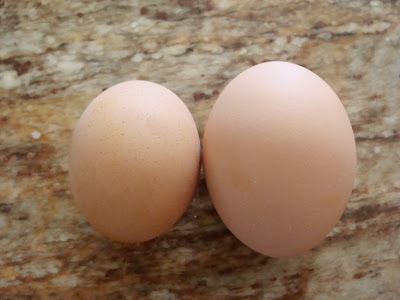 It is hard to know how many of the chickens are laying (or not laying) now, but I think we can assume that the egg on the left here is from a hen who is fairly new to the game! The egg was the perfect size to make an egg wash for the batch of mince pies I made this morning. 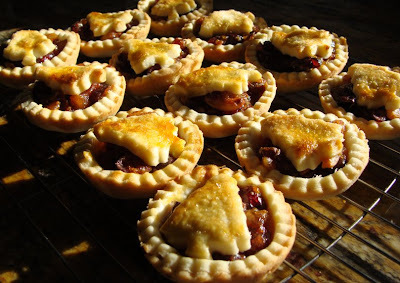 The mincemeat filling was a cranberry and orange one, based on a recipe from Lakeland [which has now vanished - but this one on the BBC site looks very similar]. You cook the apples before making the mincemeat, which wasn't a method I'd used before, but the results were fantastic. I'd go as far as to say that this is the best mincemeat I've ever tasted. The only changes I made were to replace the regular suet with vegetable suet and I didn't have any walnuts, so I put slivered almonds in there instead. I love the look of your tarts .. they are scrumptious !! Yes the tarts were LOVELY! I was lucky to get to eat one!